The iTRAQ Reagents are the first set of multiplexed, amine-specific, stable-isotope reagents that can label all peptides in up to eight different biological samples enabling simultaneous identification and quantitation, both relative and absolute, while retaining important PTM information. There are two types of iTRAQ reagent kits, 4plex and 8plex. The iTRAQ Reagents - 8plex kits are also available in more economical bulk packs. iTRAQ® Reagents are an isobaric, peptide-tagging technology that enable you to label all primary amines, regardless of peptide class. Because important information, such as post-translational modifications (PTMs), is retained, this tagging system allows you to extract more detailed information from your samples. Figure 1: iTRAQ® Reagent - 8plex protein quantitation. The ability to analyze up to eight different samples simultaneously gives you even more experimental-design flexibility. Multiplexing enables you to compare numerous sample states and provides the flexibility to run duplicates and triplicates. MS/MS fragmentation of peptides labeled with iTRAQ® Reagents - 8plex results in cleaner spectra with increased signal, giving higher confidence in peptide identifications. And the tagging and analysis of multiple peptides per protein further enhances protein identification. Figure 2: iTRAQ® Reagents - 8plex protein identification. Whether you are performing relative or absolute quantitation, iTRAQ® Reagents - 8plex, MS instrumentation, and application software provide an integrated solution with the ease, flexibility, and confidence in protein quantitation and identification you need for quantitative biology. These reagents are ideal for many applications including pull-downs, membrane protein studies, discovery and validation analysis for biomarker elucidation, and absolute quantitation of target proteins of interest. The reagents are compatible with most mass spectrometers but are optimized for SCIEX instruments. Contains iTRAQ reagents 114, 115, 116, 117 (4plex) and the appropriate buffers and reagents for 10 two-plex, 6 three-plex, or 5 four-plex assays. 10-pk trypsin is sold separately. Each individual 1-unit reagent tube has the capacity to label up to 100 ug of protein digest (Note: Recommend using 50 ug of protein digest for plasma and serum). A modified (TPCK treated) serine protease that specifically hydrolyzes peptide bonds at the carboxyl side of lysine and arginine residues. Contains calcium chloride which may improve consistency in digestion. Modified trypsin is treated with N-tosyl-L-phenylalanine chloromethyl ketone (TPCK) to inactivate extraneous chymotryptic activity. Each package contains 10 vials containing 25 µg in each vial, sufficient for 12 duplex, 8 three-plex, or 6 four-plex when using 100 ug of sample. For serum/plasma experiments we recommend labeling 50 ug of protein per sample (therefore you will need only half as much trypsin). Contains iTRAQ reagents 114, 117, test sample, buffers and reagents to develop a robust enzymatic digestion and peptide labeling protocol for up to three separate analyses. Each individual reagent is capable of labeling up to 100 ug of protein digest. Included: Starter Kit - Hardware, Cation Exchange Buffer Pack and Cation Exchange Cartridge, Protocol, iTRAQ Reagent Kit. For offline sample prep, please order this together with 4326688, 4326690 and 4326689. No Syringe or tubing is provided by Sciex. Contains iTRAQ Reagents 114 and 117 and the sufficient material to develop a robust protocol and verify that your sample preparation protocol does not interfere with labeling and digestion. Kit contains reagent, reaction solution and test mixture. Cartridges (part number: 4326695) and cation exchange buffer (part number: 4326747) need to be ordered separately. Contains sufficient reaction solutions and iTRAQ Reagents 114, 115, 116 and 117 for 8 duplex or 4 four-plex experiments based on 50 ug of protein per sample. A modified (TPCK treated) serine protease that specifically hydrolyzes peptide bonds at the carboxyl side of lysine and arginine residues. Modified trypsin is treated with N-tosyl-L-phenylalanine chloromethyl ketone (TPCK) to inactivate extraneous chymotryptic activity. Each package contains 8 vials containing 25 µg in each vial, sufficient for 10 duplex, 6 three-plex, or 5 four-plex when using 100 ug of sample. For serum/plasma experiments we recommend labeling 50 ug of protein per sample (therefore you will need only half as much trypsin). Note: Does not contain calcium chloride. Contains sufficient reaction solutions, test mixture and iTRAQ Reagents 114, 115, 116 and 117 (for 25 ug protein) to label 10 duplex, 6 three-plex or 5 four-plex experiments based on 25 ug protein per sample. Includes SDS – Denaturant, TCEP Reducing Reagent, MMTS cysteine blocking reagent, TEAB buffer and Isopropanol. Enough for 2 multiplex kits. Contains iTRAQ Reagents113, 114, 115, 116, 117, 118, 119 and 121 and sufficient material to develop a robust protocol and verify that sample preparation procedures do not interfere with labeling and digestion. Also included are SDS - Denaturant, TCEP Reducing Reagent, MMTS cysteine blocking reagent, TEAB buffer, Isopropanol. Contains iTRAQ Reagents 113, 114, 115, 116, 117, 118, 119 and 121 and sufficient material for five 8plex assays. 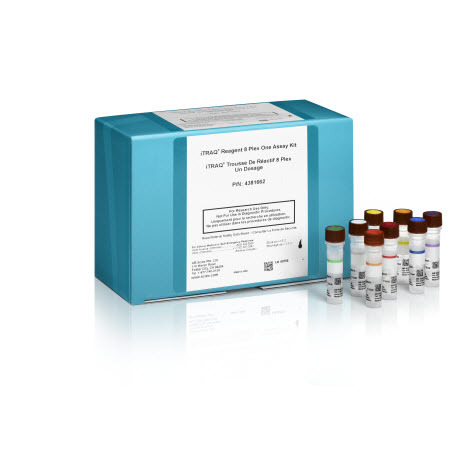 Each individual 1-unit reagent tube has the capacity to label up to 100 ug of protein digest (Note: Recommend using 50 ug of protein digest for plasma and serum). Multiplex Buffer kit (PN 4381664) sold separately. Includes, 8 tubes, each tube contains 25 units of an individual 8plex reagent. Includes, 8 tubes, each tube contains 50 units of an individual 8plex reagent. Includes, 4 tubes, each tube contains 25 units of an individual 4plex reagent. Cartridge holder to operate cation exchange cartridges and avidin affinity cartridges. Outlet tubing used for manual operation of cation exchange. Used to manually operate the cation exchange. Package of five 0.2-ml cation exchange cartridges. Cartridges are operated with cartridge holder (sold separately). Is iTRAQ available in bulk? Yes. Bulk reagent is available in 25 and 50 unit kits of iTRAQ reagents only. You will need approximately one Buffer kit per 10 units. Why is there a large difference in incubation times between 4-plex and 8-plex iTRAQ? Are 114 -117 from 4-plex the same as 114 – 117 of 8-plex? Why do I see a different charge state distribution of the target peptides after using iTRAQ? Can I re-use the iTRAQ reagent after the vial has been opened? No. Each vial of iTRAQ reagent is filled and capped under inert gas. The reagent is easily degraded by moisture leading to poor subsequent labeling efficiency. In the case of bulk reagent kits, there is a specific protocol to follow for aliquoting and storage. My iTRAQ solution seems to be a different colour, is it OK? Probably. The colour of the iTRAQ reagent can vary slightly depending on many factors ranging from trace metals to moisture. The reagent performance is typically unaffected. How much protein can I label? How long can I store sample after labelling? we recommend you label only when you are going to analyze the samples immediately, please do not store your labelled samples for longer than two weeks.